The cocktail series continues this week and if you’re a Halloween lover, then this one’s for you! We are all sharing our favorite Halloween Cocktail and mine is a cute one! (Don’t worry, I’m sure there will be some scary cocktails shared by friends at the bottom of this post. Be sure to read all the way to the end to see them.) I’m going to show you how to make a Candy Corn Martini. Easy, easy, easy. Did you see the other Fall Cocktails in this series? In case you missed them, I made Chumchata Chai, Apple Cinnamon Martini, and Blueberry Moscow Mules. Do you like candy corn? I must admit, I like the look of candy corn better than the taste. It’s a little too sweet for me. But candy corn sure does look pretty in a candy jar! That’s what drew me to making this martini. I loved the look of it! Plus I’ve never met a cocktail with grenadine and pineapple juice in it that I didn’t like! 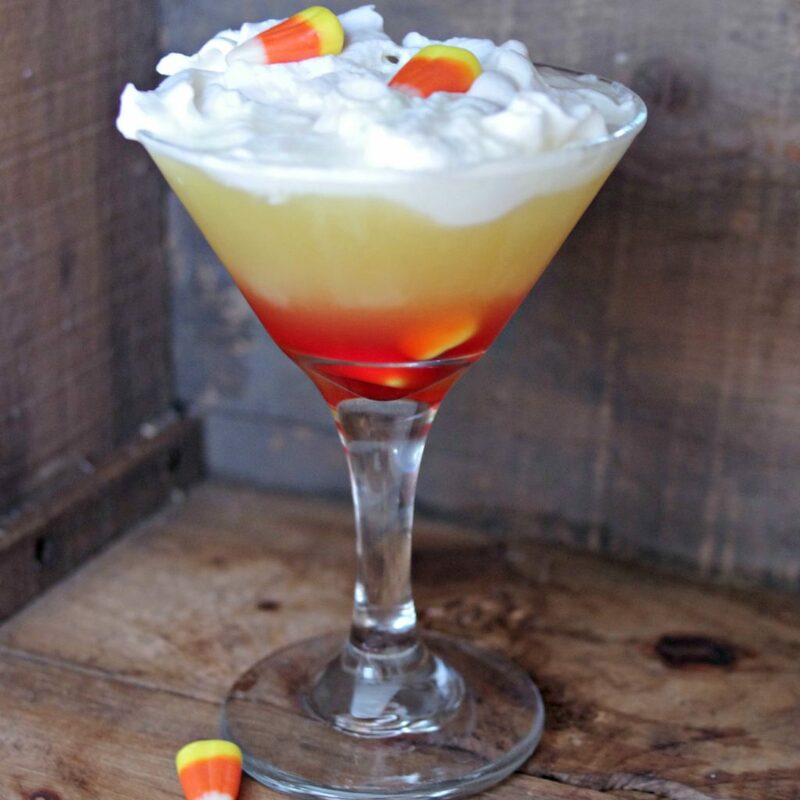 I definitely want to try this candy corn martini! The addition of whip cream really makes it a treat! I love the layered look of this drink, and the whipped cream is the perfect way to top it off. YUM! This looks like a great cocktail. I am a fan of candy corn, so this would be right up my alley. Can’t wait to give it a try. 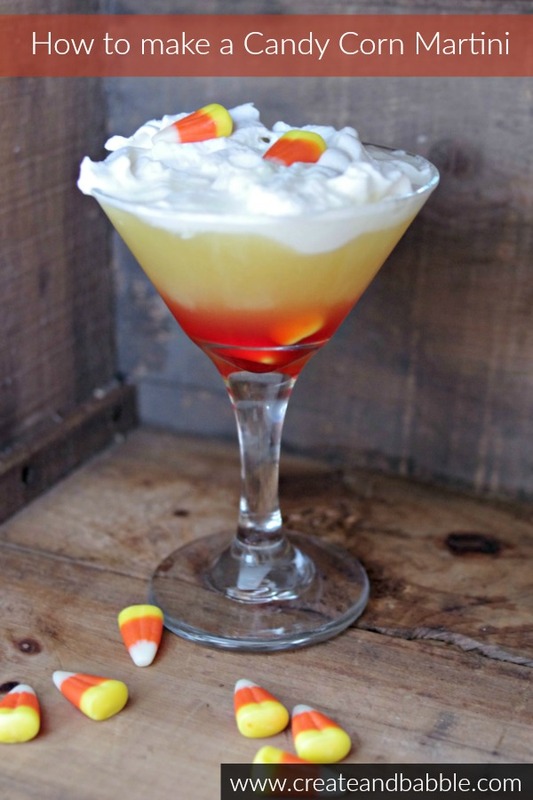 I am ALL about this Candy Corn Martini! This is the perfect Halloween cocktail. Cannot wait to try this! This sounds delicious and I’ll have to give it a try. Thanks for sharing on To Grandma’s House We Go! This is the perfect recipe for my halloween party! Thanks for this! I’ll also check the other recipes you recommend. Yum, I just had to pin this fun cocktail. I am going to surprise my family with it on Halloween. What could be better than candy corn and whipped cream? OMG this looks really, really good! I can’t wait to try to make it. This looks to pretty to drink. I’ll be featuring this tonight at Merry Monday! Hope to see you at the party!